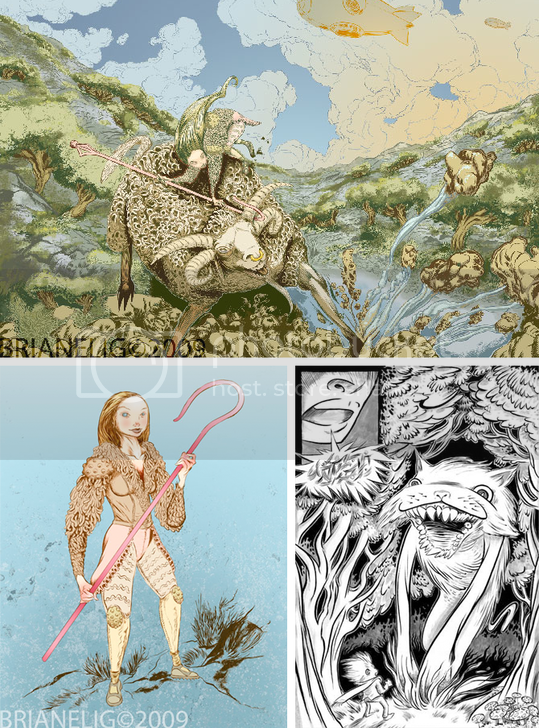 The Art Department: Brian Elig speaks Girrafe. And other stuff. We started a new series on Tor.com, I Speak Fluent Giraffe, featuring the insane grumblings of one Jason Henninger. Throughout December that means grumblings of a Cthulhuian nature, afterwards it will branch out (as if anything could be beyond Cthulhu's reach.) Only one episode old right now, but this series will grow fast as a Dunwich child. Check out: I Speak Fluent Giraffe. I loved Brian's work and would visit his website a few times a year since that lecture. Honetsly, I doubted I'd have an assignment with the right mix of creepy sweetness that is in so much of Brian's work. Thankfully, Jason Henninger's whimsical poems about horrible evils were a perfect match. Two nights ago I was giving a lecture to Soojin Buzelli's SVA class. The Brian example reminded me to tell the students the unfortunate truth about marketing -- you never know what is going to work or when it will work. A postcard sent today might get you work right off, or, it may stay tacked to an AD's wall for years before they call. I'm constantly going through years old Spectrums. A promising portfolio review my stick in my mind for ages before I have the right assignment. There's no way around it: Emerging artists need to take advantage very means of showing their work, update those efforts, and try to stay confident that steady progress in their work (artistically and marketingly) will pay off in the end. It's hard work to keep that faith up. Hats off to you guys. I couldn't do it. Thank you so much for the props here, Irene. I just gotta say its an honor to work with you and Jason. Illustration is my first love and always will be.